ONE PIECE PERFORMANCE PLUG. If you need utmost ignition performance & spark voltage at unparalleled levels don't miss the chance to purchase our racing plugs. Misfires are now controlled & racing plugs will allow you to have steadily high levels of improved acceleration & throttle response. Due to Brisk innovation & 20-year experience in plug manufacturing, misfires & non-firing have been significantly reduced consequently combustion conditions have improved dramatically, generating more engine performance. Multi-spark plugs increase the HP. 2 auxiliary electrodes applied by a special patented technology on the insulator tip enable simultaneous flashover of two surfaces & one air-gap spark at one impulse of the ignition system. Each of the sparks can flash along the whole perimeter of the auxiliary electrode (360°). Spark gap protrudes deep into the combustion chamber & improves initial phase of spread of the flame front. Number of sparks as well as the distance between them reduces possible imperfect ignition, increases combustion speed & performance. Racing plugs' design ensures optimum mix ignition, now you can improve economy, reduce harmful exhaust emissions & maximize engine horsepower. Our racing spark plugs are designed for high performance circuit racing or fast street driving. Brisk plugs outperform other brands in durability as well as efficiency. If you are sick of wasting money on high gas prices & looking for better performance from, then these racing spark plugs are for you. Brisk plugs are going to save your money every time you fill up the tank, besides you will experience dramatic changes in acceleration. 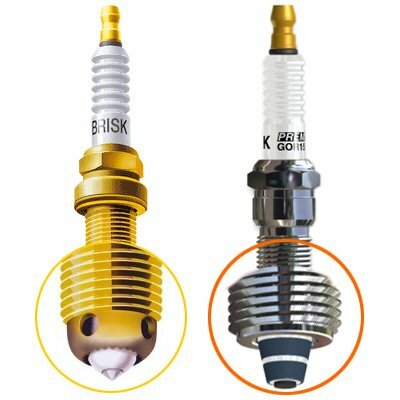 Brisk has been dealing with manufacture of special spark plugs since 1990. Brisk's experience warrants peak performance, reliability & perfect style. Brisk plugs are made in EUROPE.